Currently, if a user edits their answer more than a certain number of times, that answer is automatically converted by the system to community wiki status. This trips up many well-meaning and active contributors to the site, and I believe it no longer serves a useful purpose. Therefore, I propose that the system no longer automatically convert answers to community wiki due to a large number of edits. I know we've had this discussion before, and this was declined at that time, but the site has changed since then. Suggested edits allow anyone to provide improvements to answers, making the lowering of the reputation threshold for edits on community wiki posts effectively meaningless. We've also been able to observe the behavior of people in the years since then. We see a decent number of flags and Meta posts from people shocked that the system did this to answers that they've curated, and disappointed with the reputation they've lost as a result. Handling the flags on this and reversing wiki status takes up moderator time that could be better spent elsewhere. I understand the argument that people should try to make more substantive edits, but is this really that big of a problem? Do we care if someone makes many small tweaks to their answer over time to keep it up to date? We want people to maintain their answers over a long period, and keep them from becoming outdated. Given that few people seem to be aware that the automatic conversion even takes place, it wouldn't even seem to be a good deterrent of this behavior anyway. I know that only a very small number of people are affected by this, but the harm appears to outweigh any possible good that this feature provides, so I propose that it finally be removed. We have disabled all forms of community wiki automatic conversions, not just for answers but for questions as well. The feature was never really about encouraging substantive edits as much as it was about prevent abuse. And in fact it punished people who made not just substantive edits, but lots of substantive edits. To handle the cases spoken about the abuse cases the system was originally meant to prevent, flags are now raised for moderator attention in the event of several edits. However, even in this scenario, community wiki probably won't happen. In most cases nothing will happen. If things do happen, it'll most likely be the moderator commenting to consider the substance of edits, or sending a moderator message in the case of particularly high abuse. Answers and questions will be of equal interest in this situation, so no special treatment I feel is necessary in this case. I agree that this feature is entirely undiscoverable for the normal user; no warnings are given that CW conversion takes place, nor is this highlighted anywhere in the editing help text. Even worse, when this happens, you are not notified. I discovered one of my posts was converted because I saw an upvote in my reputation tab without a score before I had hit the reputation cap, the edit to the post itself carried no indication that a CW conversion was about to apply. I'd like to see how many posts are converted this way; per month, how often does this happen? How many of these then lead to a request to revert? Can we see a sample of cases where the CW conversion was justified? Depending on how often this happens, how viable would it be to remove the behaviour altogether, and instead auto-flag posts that see a lot of minor edits over time. Say, 10 edits below a threshold by the same author leads to an auto-flag for moderator attention. If the moderator then finds abusive bump editing, the post can be locked, or manually converted to CW, or the user given a warning. This should only be implemented if the number of posts that qualify for such auto-flagging is about the same or fewer than the current rate of 'please un-CW my post' requests. Reading another, related question on meta made me wonder if we should be checking the time between edits. All this is also assuming that it's the author making all the edits. 10 (or some reasonable number) of edits in a short time, they get the CW. 10 (or some reasonable number) of edits over the last year, they don't assuming at least N days have passed between edit 1 and edit 10. There may be a more nuanced way of doing this - hopefully it sparks an idea or two. We want to discourage minor edits for purposes of bumping, but at the same time we want to encourage users to maintain their answers over the years. Unfortunately, these 2 ideas are incompatible. What incentive does someone have to maintain their answer over the next edit is going to push them into CW world. When the site was new, anyone needing to make 10 edits to the same post was extremely rare. In the first year of the site's existence that ended up being roughly 1 edit per month. But SO is now over 5 years old; that is only 2 edits per year, and eventually (hopefully), that number is going to drop to 1 edit per year in less than 5 years. In my opinion 1-2 edits per year seems reasonable for someone keeping up with technology or finding a better way to accomplish the same goal. So rather than removing the threshold completely, I suggest scaling the auto-conversion to CW based on edits vs time. Keep the current 10 edits before auto CW conversion for the 12 months1. After the post is 12 months old, the tracked edits (for purposes of CW auto-conversion) begin to age. 1 edit immediately ages at 12 months, and for every 6 months that passes, 1 edit is no longer tracked. This basically gives a user at least 1 free edit every 6 months to improve the post as the technology changes. Edits never age below zero so a post that has never been edited will not have 11 edits before CW after year, it would still be 10. A user creates an answer today (12/24/2013). That user edits the post 8 times over the next couple of months because they realized they made a number of typos. A number months later (let's say Nov 2014), the technology in which the answer is based has a new release that makes solving the initially problem easier, so he edits the answer to improve it. In January 2015 (more than 12 months later), the technology has another update to fix some bugs and the author realizes he needs to make a couple of minor corrections to the code. Based on my proposed rules, since it is more than 12 months, 1 edit would have aged away so he would have a free edit to correct his post. The idea behind this idea is it still discourages frequent editing to posts so users do not try to abuse the editing system by bumping their posts for rep gain. But at the same time it encourages someone to maintain their posts by not letting a lot of editing early in the life of the post forever trap them right below the threshold for auto-CW conversion. 1 - As suggested in the comments, the editing threshold on a few sites might need adjusted as frequent editing is more common based on the scope of the site. For example, Gaming.SE apparently has more frequent editing due to do the frequency that patches are released. I'd say that this scenario is an exception and maybe there could be some site-specific customizations that can be done to adjust the rate in which the edits age. The answer with which I bumped into this - sure, I made repeated edits the morning that I posted it. I was not gaming anything, just moving quickly to fine tune an answer and make it more comprehensive for everyone's benefit. To then eternally get no points for upvotes is silly I think. Beyond the lack of SO help content to warn of this phenomenon, what I find particularly nutty is the apparent inconsistency with which it is handled when flagged for moderator attention by a first-time "offender". Based on MSO comments I flagged my aforementioned answer for moderator attention thinking that the auto CW conversion would be removed as a first-time, didn't-know courtesy. My edits were clearly not intended to bump (which I didn't even know about until reading so much related commentary on MSO) but rather to improve; but my request was declined with "Too many minor bumping edits in a short period of time" to my surprise. The biggest deal in the world? No. Still lame? Yes. Somebody wrote a bot that would just revise posts every minute to keep it on the top of the stack. Actually there is a certain amount of people doing that still, which I'm trying to discourage. I also noticed the emboldened part. Although this quote is from 2008, it is a small indication the CW edit limit may not work as a counter-measure. How effective is a bump bot, really? Should we actually care about this? How much rep can you actually accumulate by auto-bumping a post? If the post is not good people aren't going to upvote it just because it's at the top. It seems like a better counter-measure would be to flag this behavior automatically and put the revision histories somewhere. Dollars to donuts plopping posts that have been edited a lot of times in a review queue would be much more effective at catching rep farming than passively discouraging it. A revision history like this would be obvious at a glance. But I have doubts about how important this really is. My personal opinion is that I don't care. I would care if there were more than a few people doing this and they were farming lots of rep but I find that very unlikely. 10 edits is still a lot of bumps. A rep farming bot could just stop at 10 ... this is a very easy counter-measure to get around. Same thing for somebody doing it without a bot. And 10 bumps is enough to ensure visibility for a couple of hours. It's also not actually a particularly high ceiling for legitimate edits. I've hit it once by accident and almost did another time (that I know of). Both times it really didn't seem like I had made that many edits. Not all answers happen immediately. Sometimes you've already edited it before you have that other good idea. I would be more comfortable if edits could only bump something like once per two hours. This would reduce the effectiveness of abuse and frankly bumping all the time is something I find a little annoying when I'm editing legitimately. Edits cause a bump so the solution is to discourage edits...? If the problem is bump abuse, then discourage bump abuse. I'd just disable bumping for self-edits after the 10th edit. This will remove any benefit for the user to exploit this to gain more attention to their post. And I think the lack of review is an acceptable risk in this case. If a user rage-quits and vandalizes their own posts there is an automatic flag already, and that should catch this kind of abuse even in the absence of bumping those posts. There are also additional safeguards that could be implemented, e.g. by still bumping if an edits changes 50% or more of a post. The auto-CW after five different users edited a post also doesn't serve any useful purpose in my opinion and could also be disabled without any drawback. typo fixes - edits that change only single letters in words, add/remove a/an/the etc. Can we say that anything that adds/removes up to 2-3 letters somewhere in text is typo fix? That would enable actualization of posts, that in most cases would not trigger community wiki conversion. To prevent unrestrained bumping, just don't bump such edits as well. Not the answer you're looking for? Browse other questions tagged feature-request status-completed edits community-wiki . Is there any point forcing a post to Community Wiki after 6 owner edits? Why does repeated editing by same user lead to community wiki? 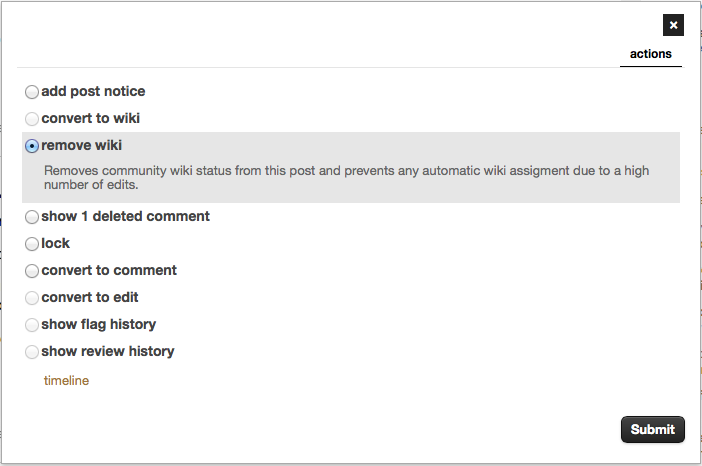 Which edit actions can move a post into Community Wiki mode? Give some kind of warning before Community Wiki takes effect?